Raw honey is high in antioxidants, which help boost the immune system, and can be used as a sleep aid or to heal wounds and burns. Next time you have a cold, eat a tablespoon of honey to ease a cough. Try using honey in salad dressing recipes, or drizzling it on fruit or toast with butter. Honey can also be used to replace sugar in most baking recipes, just use ½ to ⅔ of a cup of honey for every cup of sugar the recipe calls for. It’s worth noting that honey is still high in sugar and calories, but it contains vitamins and minerals, which white sugar doesn’t. 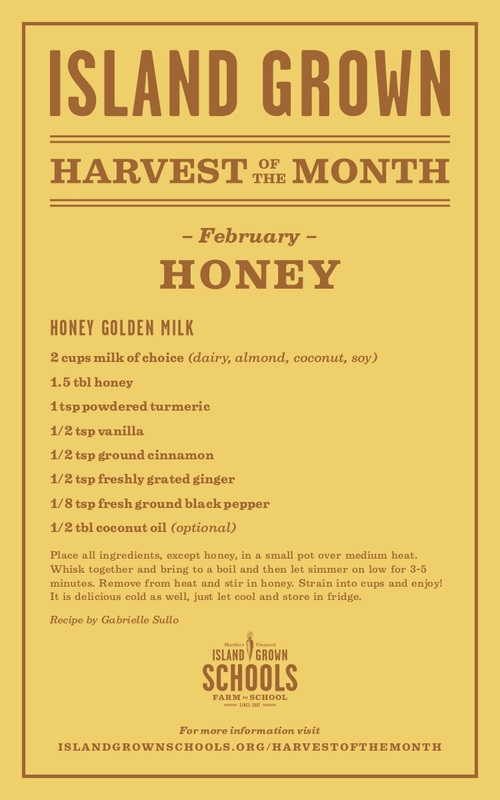 Check out our featured recipe of the month, golden honey milk. Honey contains more nutrients when it’s unpasteurized, so look for raw honey when shopping, and try to buy as local as possible. 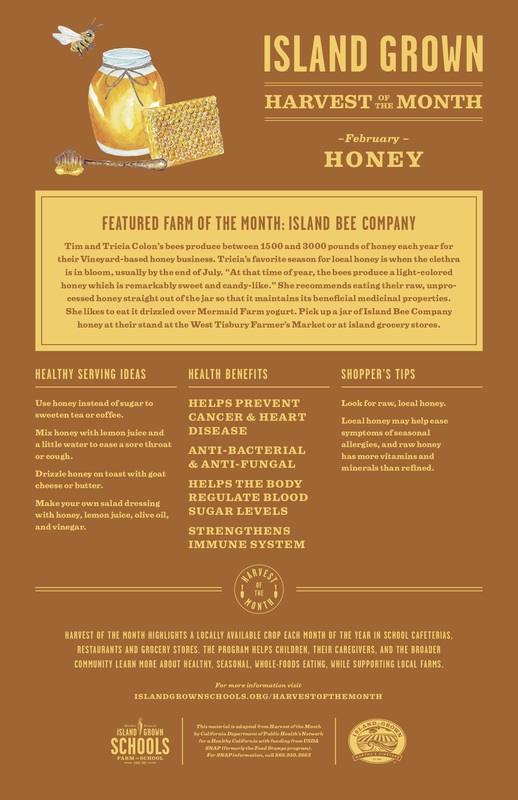 You can find Island honey at Cronig’s, Edgartown Stop & Shop, and Ghost Island Farm. Check out this info sheet for other healthy serving ideas and some shopping tips. Have you seen photographer and IGI Board President Randi Baird's Harvest of the Month blog posts? This month, the local crop we are celebrating is honey, and she has a great post up with a recipe. Click here to read the blog.